Most transition studies are historical in nature and fail to arrive at prospective conclusions about future potential. In this paper we develop a new prospective transition framework, which revolves around the interplay between business models and socio-technical contexts. 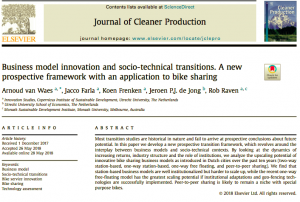 By looking at the dynamics of increasing returns, industry structure and the role of institutions, we analyze the upscaling potential of innovative bike sharing business models as introduced in Dutch cities over the past ten years (two-way station-based, one-way station-based, one-way free floating, and peer-to-peer sharing). We find that station-based business models are well institutionalized but harder to scale up, while the recent one-way free-floating model has the greatest scaling potential if institutional adaptations and geo-fencing technologies are successfully implemented. Peer-to-peer sharing is likely to remain a niche with special purpose bikes. Download the 13 page study here.